Little Button-quail are widespread across the inland and in good years become very common. They are the most widely distributed of all the button-quail and are absent only from the humid tropical north and the far SE and Tasmania. They are regarded as being nomadic, wandering widely throughout the arid zone in search of good conditions. 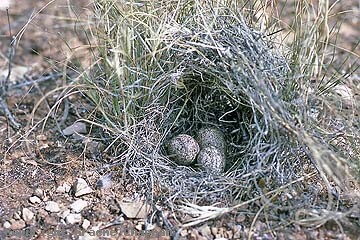 018011 ... Nest of Little Button-quail, Nullarbor Plain.